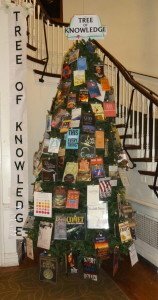 The Freethought Society (FS) and the Ethical Humanist Society of Philadelphia (EHSP) invite you to the installation of the 2016 Philadelphia Tree of Knowledge. 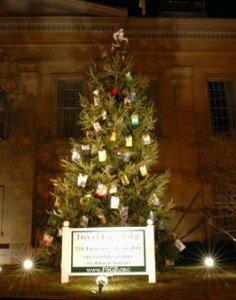 The Tree of Knowledge will be decorated as a group effort immediately following the EHSP platform and a Rollin Wilber piano mini-concert on Sunday, December 4, 2016. Hugh Taft-Morales will be the platform speaker. The 11:00 AM free and open-to-the-public platform takes place in the Ethical Society Building, located at 1906 Rittenhouse Square, Philadelphia, Pennsylvania. Attendees are encouraged to bring two color copies of the front cover of their favorite book so that an ornament can be made for either use on the 2016 tree or for a home display. Margaret Downey will be making the ornaments at 1:00 PM in the upstairs meeting room at the EHSP building. Volunteers are needed to assist in creating new ornaments which will help FS improve the diversity of The Tree of Knowledge ornament selection. Ornaments will be available for purchase. These weatherproof ornaments sell for $1-$5, depending on the size. Each year since 2010, representatives of the Freethought Society (FS) and leaders from many secular organizations have spoken at the Chester County Commissioners Sunshine Meeting advocating for the inclusion of the secular community symbol, The Tree of Knowledge, in the Winter Holiday public display that is placed on the grounds of the Chester County Courthouse located at Market and High Streets. The Tree of Knowledge was banned from public display when the Commissioners adopted Resolution 58-10 deeming that they, and they alone, would determine which symbols would represent the secular community. Since then, the Commissioners have determined that the secular community is sufficiently represented by the following items: A Santa Claus figure, candy canes, reindeer, and/or a wire train with white lights. FS contends that these items are not representative of secularists. Year after year, FS conducts an effort to convince the Commissioners that only The Tree of Knowledge symbol is acceptable as a secular winter symbol. Another attempt to reason with the Commissioners will take place on Tuesday, November 29, 2016 at 10:00 AM. The location of the Sunshine Meeting is: 313 West Market Street, West Chester, Pennsylvania 19380. Please go to the sixth floor Commissioners Board Room. Please be prepared to speak in support of displaying and including the Tree of Knowledge during the 2016 Winter Holiday public display. If you do not want to speak, please make a hand-held sign stating “I support The Tree of Knowledge” to hold up so that the Commissioners know your position in the matter. Scheduled to address the Commissioners are Hugh Taft-Morales (Ethical Humanist Society Leader), and Glen Loev (vice-president of FS and a representative from the secular Jewish community). The Freethought Society (FS) is pleased to be co-sponsoring a very special event with the Ethical Humanist Society of Philadelphia (EHSP) and the Delaware Valley Chapter of Americans United for Separation of Church and State to mark the 10th anniversary of the “Intelligent Design” court case of Tammy Kitzmiller, et al. v. Dover Area School District, et al. (400 F. Supp. 2d 707, Docket No. 4cv2688). The Sunday, December 6, 2015 event starts with a free and open-to-the-public 11:00 AM, EHSP morning platform featuring Hugh Taft-Morales (EHSP Leader). This event will take place at the EHSP building located at 1906 South Rittenhouse Square, Philadelphia, Pennsylvania 19103. The 2015 EHSP/FS Tree of Knowledge will be decorated after the platform speech and everyone is invited to participate. There will be music, singing, and books to purchase from authors. Join us for the morning platform, Tree of Knowledge decorating party (There will be a children’s Tree of Knowledge this year! ), luncheon, presentations, and happy hour.